The vaunted Academy of Motion Picture Arts and Sciences has begun voting on who wins what at the Oscars, and if one race is still slightly clouded in mystery, it’s the one for best actor. 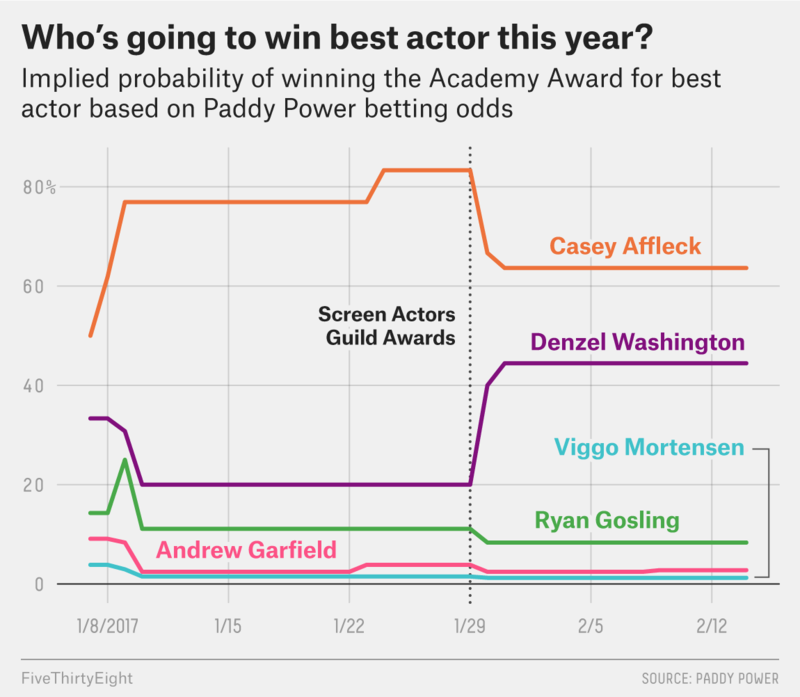 This contest — among Casey Affleck (“Manchester by the Sea”), Denzel Washington (“Fences”), Ryan Gosling (“La La Land”), Andrew Garfield (“Hacksaw Ridge”) and Viggo Mortensen (“Captain Fantastic”) — has been an odd one to watch. Now we get to the real competition: Washington, who plays the lead in a film he directed, and Affleck, the gruff Bostonian who utterly transformed in the film “Manchester by the Sea” to play a dour New Englander. Washington received the top male acting honor from the Screen Actors Guild, and Affleck won just about everything else. In 18 of the past 22 years, the actor who won at SAG went on to win the Oscar. The best actor SAG award is one of the most historically predictive shows in our database of 25 years of critic and guild prizes. Washington’s SAG win could be interpreted as a sign that the academy’s largest branch is not behind Affleck. It could also be interpreted as a sign that Washington is way more famous than Affleck, had never won a SAG Award and was overdue, and was in a very good film. Affleck’s win at the BAFTAs could be interpreted as a sign that the insiders who vote on the Oscars are comfortable voting for him. 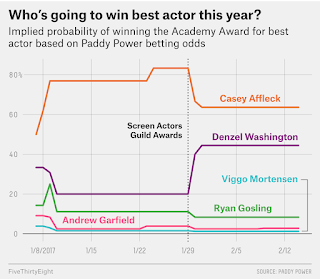 It could also be interpreted as a sign that Affleck can win, but only when he’s not competing against Denzel. Not to politicize this, but does the whole "race between candidates where one is alleged to have done some awful things to women and the other is unbelievably overqualified to win" seem familiar? Just me?